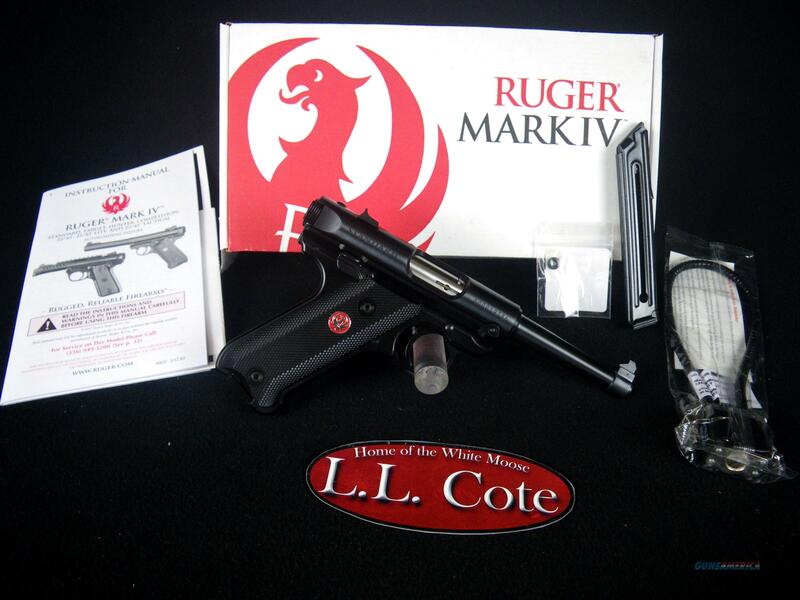 Description: You are bidding on a Ruger Mark IV Standard in 22lr with a 4.75" barrel. Simple, one-button takedown for quick and easy field-stripping and proper chamber to muzzle cleaning. A recessed button in the back of the frame allows the upper receiver to tilt up and off of the grip frame without the use of tools. One-piece, precision CNC-machined grip frame. Ergonomic bolt stop. Smoothly contoured, comfortable grip features natural pointing grip angle with replaceable, checkered grip panels for a non-slip hold. Internal cylindrical bolt construction ensures permanent sight to barrel alignment and higher accuracy potential than conventional moving slide designs. Contoured ejection port and easy-to-grasp bolt ears allow for durable and reliable operation round after round. Accurate sighting system features fixed sights and drilled and tapped receiver for Weaver- or Picatinny-style rail for easy mounting of optics. Ambidextrous manual safety positively locks the sear in the "SAFE" position when applied. Safety can be converted to left-side only with included washer. Features a conveniently located push-button magazine release on the left side of the frame. Magazine drops free on release for faster reloading. Magazine disconnect prevents discharge when the magazine has been removed. Also includes: two, 10-round magazines. Displayed images are stock photos. Any questions please feel free to ask (our phone number is in the additional information tab above).